This blog is about "Everything & Nothing" (= Ois & Nix) --- There is no dedicated overall theme for the posts, but most topics are technology related, a few posts are about traveling. Where should you go if you can spend three weeks in Brazil? Not an easy question to answer. Brazil is such a big country, you need to select a few spots to make sure you have enough time to enjoy this beautiful and interesting area of the world. 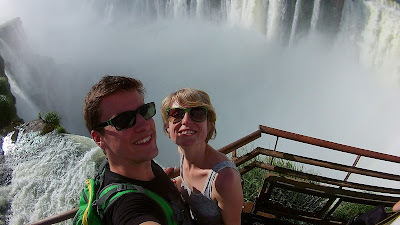 If you don't have enough time to read the whole blog, invest 5 minutes to see 50 great things you can do in Brazil in this video. The following practical guide shows you how we spent our three weeks in Brazil in May 2016. Learn some important words/phrases in Portuguese, e.g. how to order food; saying hello, please, thank you; asking for directions... A good starting point is Memrise, an interactive app. Get all required vaccinations. It depends when and where you go exactly, but vaccinations for hepatitis B and yellow fewer are always a good idea. We brought malaria medication with us, but did not use it in the end. Book domestic flights in advance to get better rates. Well, you always hear stories about people getting mugged in cities like Rio or Salvador. We followed the basic rules of not wearing jewelry, expensive watches or caring cameras around. Additionally we asked at the hotels which areas to avoid and we never had any issues. The only partially dangerous situation we had was when there was a special forces operation in Rocinha (a Favela in Rio). Read all about it here. Generally speaking life is cheaper than in European countries such as Germany or Austria, but as everywhere, you will find expensive hotels, restaurants, shops in Brazil as well. Caipirinhas are usually cheaper than in Europe (between 5 BRL and 14 BRL). A large beer (625 ml) is around 10 to 12 BRL, a main course in a nice restaurant between 40 and 55 BRL. Domestic flights can be cheap, e.g. the combined flight tickets Iguacu to Cuiaba + Cuiaba to Salvador + Salvador to Rio cost us in total around 270 EUR including luggage. We stayed in hotels with rates between 30 and 80 EUR per room per night. Do I really need to learn Portuguese?Short answer is yes. Whereas you can find people who speak English, the majority communicates in Portuguese. Even in touristy places like the Ilha Grande Portuguese was often the only language spoken. We don't speak Portuguese, but we learned a couple of words and phrases in advance which was helpful. Memrise can be quite useful for learning. If you know Spanish, you should be fine. Is it good to go there in May? Going there in May has a major advantage: It is not the typical tourist season, so popular places like the sugar loaf mountain or the Iguacu waterfalls will be less crowded. In general we had good weather, 1.5 days of rain in Rio is not too bad. It could have been warmer though on the Ilha Grande. Keep in mind that the sunset is already around 5 to 5:30 at this time of the year. Which tour should I choose if I want to go to the Pantanal? We booked our tour with Ecoverde Tours and were really happy. Please read all about it here. Should I really do a Favela tour?Absolutely, even though we had an "eventful" time there! It is very interesting to see how people live together in a Favela. We have met so many friendly and nice people there. Read all about it here. How and where should I get cache? We did not exchange any money in advance and just used the ATMs. When getting cache from ATMs be aware that in the evening they have some limits. If you need big amounts, withdraw them in the morning. Not all banks allow withdrawl using international banks. We had good experiences with ATMs from Santander. Are you looking for an alternative itinerary? See Michael Sommers' blog post here. I recently bought a set of Milight (aka Limitless LED, Mi-Light, Easybulb) bulbs including the Wifi bridge. It is really easy to configure and a great value for money. Goal: Since I am operating a CR11S Android box, I thought it would be great to control my lights with the box. The website http://www.limitlessled.com/dev gives you an overview of commands you can send to the box via UDP. Switch on group 3 and group 1, wait for 7 minutes then turn off group 1, 2 and put the Android box into standby. Mirek recently released a great Android 5.1 ROM for the Teclast X98 Plus Dual OS. Based on my tests so far, the performance has improved and the battery time is much better than with the original ROM. All the Chinese apps you usually don't need were removed.